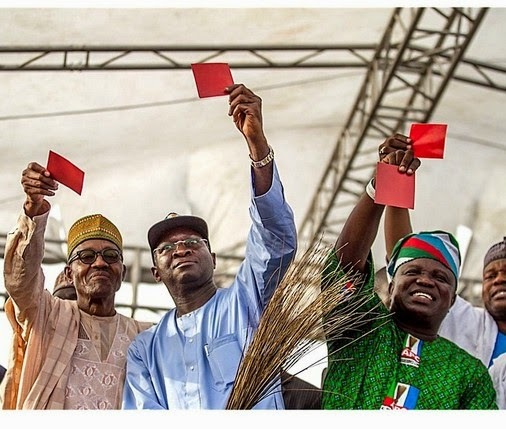 The All Progressives Congress (APC) Presidential Campaign today declared that the President Goodluck Jonathan-led Peoples Democratic Party (PDP) government has wasted one trillion Naira that belongs to the Nigerian people in his desperate quest to remain in power. it said in a press conference in Abuja addressed by Garba Shehu, its Director of Media and Publicity. The APC Campaign observed that a panoramic view of how much of Nigeria’s resources Jonathan and the PDP have spent on print, broadcast and social media campaigns just to damage the unassailable credential of Gen Buhari’s integrity would confound any casual observer of the polity in recent times. It further noted that President Jonathan has been criss-crossing Nigeria, giving an average of N50 million each to traditional rulers, most especially in the South West and the Northern parts of Nigeria. It recalled in that regard that one pastor recently confirmed that N7 billion was given to Pastors to spread unfounded allegations of Islamaphobia and scare mongering against Gen Buhari and other APC leaders. “A president and his depraved political party that finds it convenient to lavish billions of Naira on political propaganda spins, but finds it difficult to remove the corruption surrounding the access to kerosene for millions of families in this country should not deserve the votes of Nigerians,” the Campaign said. It noted that the entire oil industry in Nigeria stinks of corruption, and rather than investing its energies into how petroleum products will be accessible to Nigerians, the Jonathan government busies itself blindly spending money to confuse Nigerians about the electoral choices they make. It recalled that in various Nigerian states over the past year, in all the geopolitical zones, teachers have gone on strike on account of unpaid salaries, leaving millions of children idle and without access to formal education for months at a stretch. Similarly, many Nigerian teachers went for the Christmas holidays without having received their November and December salaries, it said, and many earn less than the agreed minimum wage. “Mindless looting of our national treasury to fund hate campaign and rent crowd at home and abroad like the case of rudderless Nigerians at Chatham House in London, arming ethnic militias for election purposes will not save this incompetent and clueless government being presided over by President Jonathan and his party from defeat on Saturday at the polls,” the APC Campaign Organization promised. It reiterated that the issues in Saturday’s election are massive corruption in the conduct of government business, insecurity, unemployment and systemic decay in all sectors of our economy. Gentlemen of the Press you are welcome to this very important press conference. We will like to bring to your attention and that of Nigerians how the President Goodluck Jonathan led Peoples Democratic Party government is wasting one trillion Naira that belong to Nigerian people in his self-serving and desperate bid for a re-election at all cost in the midst of grinding poverty his party and government has subjected Nigerians to in the last 16 years. It is unconscionable and height of betrayal of public trust that a government and a President who should preside over the husbandry and judicious use of our national patrimony is superintending over its massive squander in a futile attempt to stop the idea of change. Let us sound a note of warning at this point that no amount of sponsored negative media propaganda can stop this idea whose time has come. The APC Presidential Campaign and the acceptability of our candidate, General Muhammadu Buhari and his Vice Presidential Candidate, Professor Yemi Osinbajo has become a peoples’ movement and Nigerian masses who are the drivers of change are the major stakeholders. 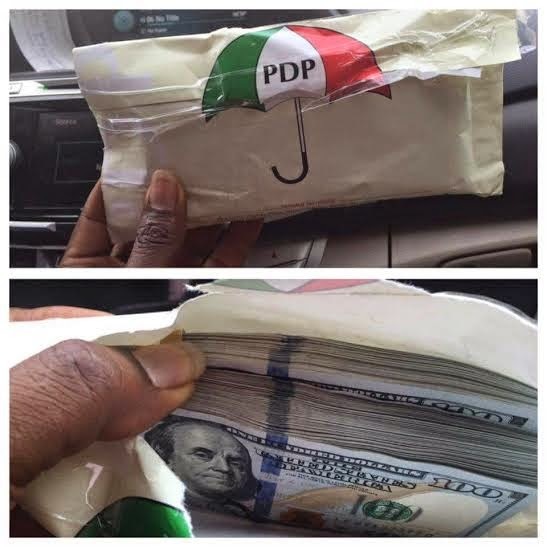 A panoramic view of how much Nigeria’s resources Jonathan and PDP have laboriously and wantonly spent on print, broadcast and social media campaigns just to damage the unassailable credential of Gen Buhari’s integrity will confound any casual observer of the polity in recent times. An average cost of a wrap around in Tier 1 and Tier 2 newspapers in Nigeria is between N15 million to N20 million and the Jonathan campaign buys average of 5 wrap around and front pages in a day in the last 3 months coupled with the hundreds of billions that have been spent on negative TV exposures on AIT, NTA and other television and radio stations across the country. We had expected that a President that has spent about 6 years in office with the revenues more than what all governments before him had received will run on a record of performance rather than peddling lies and hate media campaigns that are accentuating ethnic and religious tensions in the country. President Jonathan has been criss-crossing Nigeria giving an average of N50 million each to traditional rulers, most especially in the South West and the Northern parts of Nigeria. This week, the President’s campaign money is being shipped to the North. Letters in English and Hausa backed by millions in cash are being dispatched to willing rulers in the region. Religious leaders, trade unions, youths organisations, professional bodies, entertainers are not ruled out of the money sharing jamboree of President Jonathan. Gentlemen of the Press you will recall that a Pastor recently confirmed that N7 billion was given to Pastors to spread unfounded allegations of Islamaphobia and scare mongering against Gen Buhari and other APC leaders. We are very much concerned as a campaign organisation that this hundreds of billions that have been sunk into bottomless pit of illogical and unreasonable negative campaign of calumny can conveniently provide basic amenities and social services that will improve the standard of living of our people through improvement in our healthcare delivery system, education, road, access to credit by rural women, improve our national electricity grid to save businesses from collapsing under high cost of generating their own power. A fraction of the trillion naira hate campaign expenditure will fund the APC programme of feeding primary school pupils in Nigeria on one nutritional meal a day, comfortably pay N5000 monthly to 25 million very poor Nigerians for a year and pay unemployment benefit for one year for graduates who can't find gainful employment one year after NYSC which are core to the social welfare programmes of the APC Federal government Gen Buhari will lead. Today, we are all witnesses to the excruciating pains our people go through to purchase kerosene - a daily household need of millions of families in Nigeria. The government officially puts the price of kerosene at N50 per litre, but every household that purchases the product daily knows that they spend more than N150 for a litre of kerosene. Any businessman allocated kerosene by the NNPC returns a handsome margin that goes into the Jonathan campaign. A president and his depraved political party that finds it convenient to lavish billions of Naira on political propaganda spins, but finds it difficult to remove the corruption surrounding the access to kerosene for millions of families in this country should not deserve the votes of Nigerians. The entire oil industry in Nigeria stinks of corruption, and rather than government investing its energies into how petroleum products will be accessible to Nigerians, the Jonathan government busies itself blindly spending money to confuse Nigerians about the electoral choices they make. In various states around the country over the past year, in all the geopolitical zones, teachers have gone on strike, leaving millions of children idle and without access to formal education for months at a stretch, owing to unpaid salaries. Many Nigerian teachers went for the Christmas holidays without having received their November and December salaries. Many earn less than the agreed minimum wage. Mindless looting of our national treasury to fund hate campaign and rent crowd at home and abroad like the case of rudderless Nigerians at Chatham House in London, arming ethnic militias for election purposes will not save this incompetent and clueless government being presided over by President Jonathan and his party from defeat on Saturday at the polls. The frustrations of Nigerians on the Jonathan government are very manifest – you can almost touch it on the back of your wrist. Therefore, this election is not about how much the incumbent president and the ruling party can spend to dubiously keep itself in power. And let the PDP make no mistakes about it: this election is clearly a referendum on the performance of the Goodluck Jonathan administration and millions of Nigerians going to cast their ballot in this Saturday’s election will be going there to write an epitaph of the PDP and Jonathan government. We want to reiterate that the issues in this election are massive corruption in the conduct of government business, insecurity, unemployment and systemic decay in all sectors of our economy. They are the issues this government has been found wanting by Nigerians and for which they are ready to cast their votes for APC and our Presidential Candidate, Gen Buhari. Thank you for your kind attention and for attending this press conference at a very short notice.